Jangseong, South Korea, Shut down the illegal dog meat farms, slaughterhouses and markets. Home / Blog / Jangseong, South Korea, Shut down the illegal dog meat farms, slaughterhouses and markets. In Jangseong, there are countless dog farms, slaughterhouses, markets and restaurants where the dogs, who are tortured their entire lives, end up being slaughtered in the most inhumane ways, such as by electrocution, hanging or beating; and then thrown into boiling water – sometimes while they are still alive. In many places, dogs are being killed in full view of other terrified, caged dogs; and this takes place in broad daylight. In addition, many abandoned and stolen former pets end up in this industry, and are subjected to the same cruelty. A Search Engine reveals the sickening scale of Jangseong’s dog meat demand. The searches resulted in: 156 Health Food Shops; and 24 dog meat restaurants in and around Jangseong. Even if half of these ‘Health’ Food Shops and restaurants serve dog and cat ‘ingredients’ in one form or another, just imagine how many dog/cat slaughterhouses must be present in and around Jangseong in order to supply all of these outlets. Please sign petition, call, write and email the Jangseong Mayor and the County Council TODAY! Subject: Jangseong, South Korea, Shut down the illegal dog meat farms, slaughterhouses and markets. 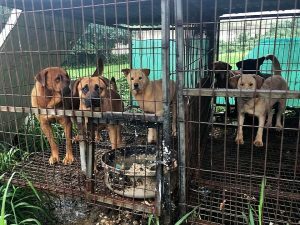 Petition: Jangseong, South Korea, Shut down the illegal dog meat farms, slaughterhouses and markets. We need more help to make Korea .abusing dogs killing dogs and cats for meat .we need more help in shutting down Restaurant.animal farms and so on .this is so wrong in what they are doing to theses dogs and cats for meat .I know they have to eat but not dogs or cats . I am trying to stop this by helping and signing the petitions every time I see it .in my heart .you have to save theses dogs and cats from abuse and people like this who think it’s ok to kill and eat theses dogs and and cats .take time out .look in the dogs eyes and see the pain and hurt you are doing .stop this right now .shut down all the bad stuff and let the dogs and cats to free please . Please stop this horrible thing, these poor dogs only want someone to love them, not abuse them. This whole thing makes me sick to my stomach!! In the name of humanity please stop this evil trade! Cruel sadistic and horifying! Please have COMPASSION and stop eating and torturing these wonderful sentient beings. if you don´t want us to call you barbarians then you have to stop this awfull and cruel torture of animals! It´s disgusting! No human needs to eat animals. Especialy in Asia there are so many resourses of vegetable food. I don´t understand how people can be so inhuman and ignorant about the pain and suffer of defenseless creatures. Inhuman cruelty to defenceless dogs and cats , people who commit these atrocities have no soul or feeling whatsoever , to hurt a living animal without emotion is sickening beyond belief . I hope the Korean government put an end too this vile practice. My heart goes out to all these unfortunate animals .